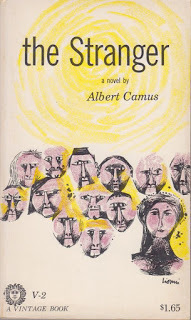 Baby boomers will recall the desert beige colored Leo Lionni cover of the Vintage edition of Camus' The Stranger which became an iconic representation of a French import called existentialism in the later 50's and early 60's--and which Steve Heller recently wrote about on his design blog, The Daily Heller. Other books like Hermann Hesse's Siddhartha and Khalil Gibran's The Prophet would achieve a similar cultish status--verging on being a mass market phenomenon if such a thing can be said about items whose basic appeal is to intellectuals. But Siddhartha and The Prophet, along with Andre Malraux's Man's Fate and Sartre's Nausea are now literary footnotes, while The Stranger seems to maintain its philosophic and commercial credibility which is to say that people continue to read and admire The Stranger in such a way, as to make one suspect that it might achieve the status of immortal works which remain pertinent while also being read differently by future generations. Hamlet is the major example of such a phenomenon. Only recently Kamel Daoud's The Meursault Investigation, a novel based on the brother of one of the main characters of The Stranger (the murdered Arab) garnered France's prestigious Prix Goncourt du Premier Roman. But what makes L'Etranger live on? Dusty streets, a random act of violence that recalls in some way another set piece of proto-existentialism, Raskolnikov's murder of the old woman in Crime and Punishment are the palette from which Camus worked. Existence precedes essence is what you learn about existentialism in philosophy 101. Humans are defined by the actions and choices they make. However, what makes the novel perennially relevant is not a philosophical aphorism but the conjunction of an idea and a world. Camus was born in the North African culture which he describes and it's as if the philosophical novel he created seamlessly evolved from a milieu, he knew--essentially a colonialist society, in which the punishment for being a lower order of the food chain was objectification. The Stranger is the other. Martin Buber talked of I and Thou (Ich und Du)), I and It. The other is the It, the person who has been denied his humanity. Perhaps the novel has maintained its hold on our imaginations because it's fundamentally about empathy or the loss thereof--a phenomenon that allows for what Clausewitz termed "the continuation of politics by other means," a state we know only too well, as war.